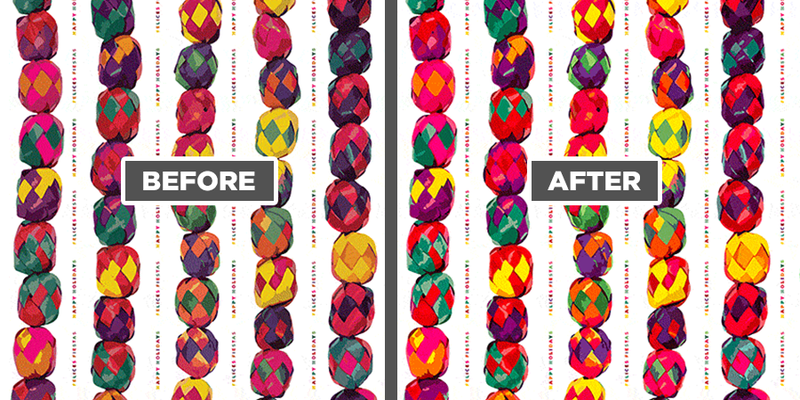 I recently used this feature to straighten an image of paper garland that I photographed and used for a custom wrapping paper design for the holiday season. I hadn’t used Puppet Warp in quite some time and was struck (again) by how powerful and simple it is to use. It was a critical step to reaching my final piece of art. My inspiration came from strands of handmade paper garland that my family has put on our Christmas tree for years. 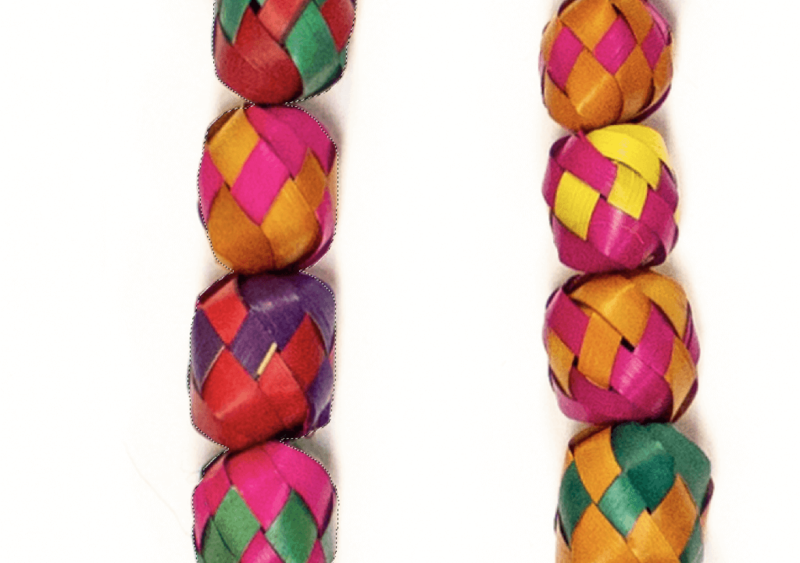 It’s colorful, festive, and since it’s handmade, each section is unique. It’s almost embarrassing how low-tech and highly amateur this photo setup was, but it’s a great example of how you don’t always need professional lighting or even a great camera to pull off an interesting design. 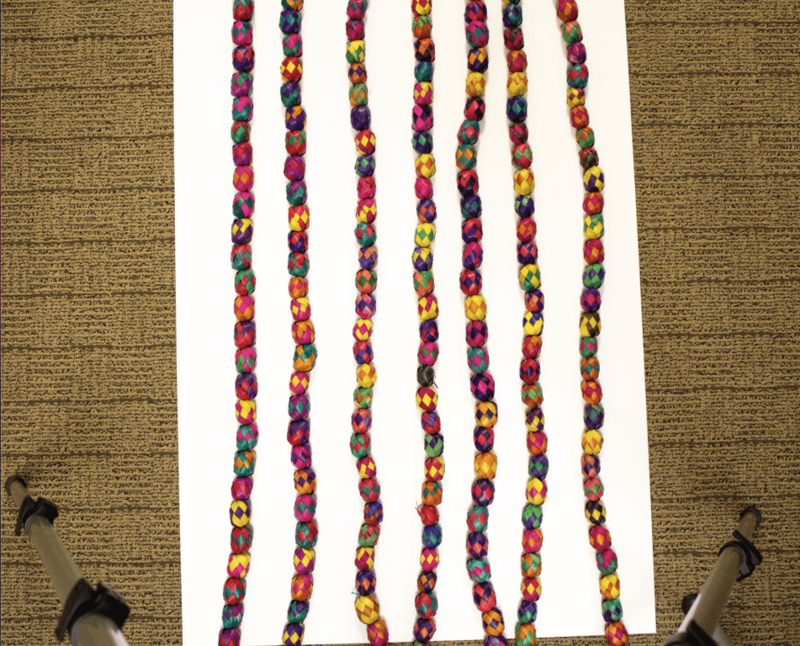 I put a large sheet of white paper on the floor, raised a tripod to the highest position possible, positioned a camera at a 90-degree angle and shot straight down on the garland under (gasp!) fluorescent office lighting and no flash in RAW format. 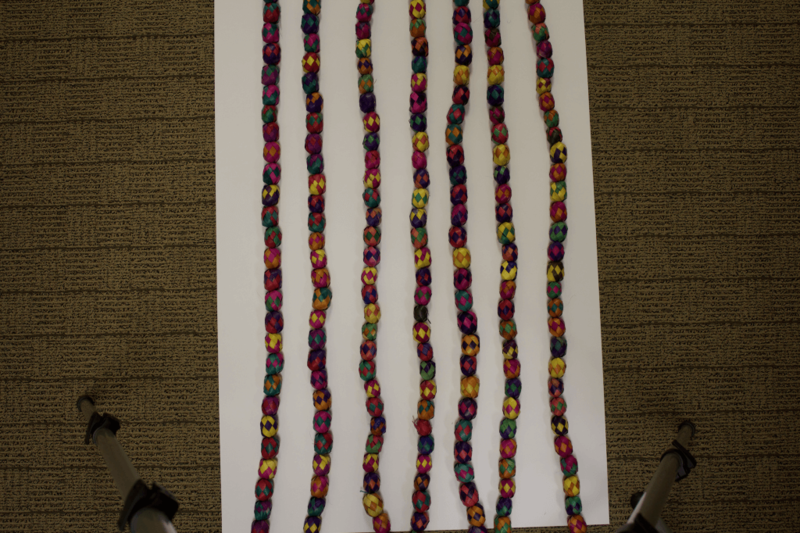 I arranged the garland on the white paper as straight as I could get it, but its natural tendency is to not lay straight due to how it’s woven together. The original shot is dull, the garland is anything but straight, and the whole thing certainly falls short of the desired level of festivity. The next step was to use Photoshop’s Levels, Curves, Hue/Saturation, Shadows/Highlights, and Selective Color tools to get the color in the original shot somewhat pleasing. 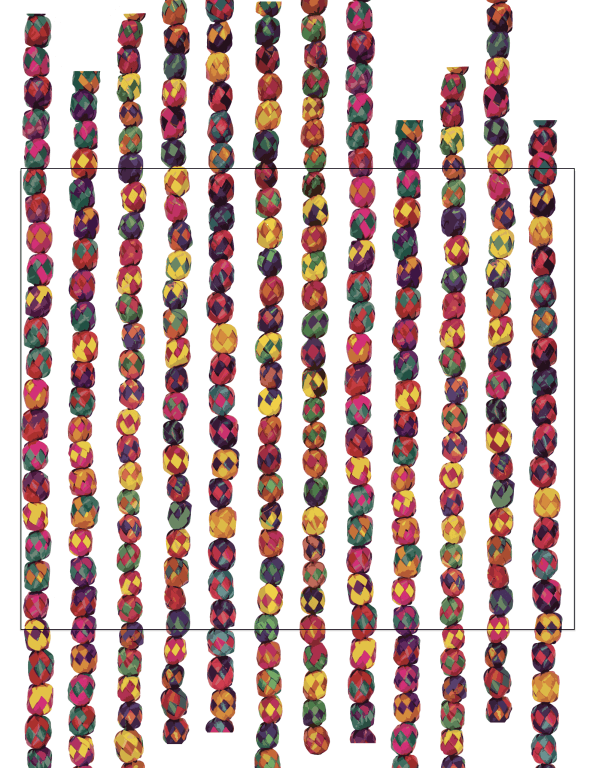 Using the lasso selection tool in Photoshop, I made a quick selection of the far left strand of garland. With the selection made, I chose Edit > Puppet Warp, and Photoshop made a “mesh” of my selected area. I then clicked on five spots where I wanted to create joints for warping. Finally, I clicked-and-dragged to move the selection until the garland appeared straight. I used a guide (in light blue) to help me make sure straight was “straight,” as you can see in the short video below. I used the same technique on all 7 strands of garland to end up with 7 unique and (almost) perfectly straight strands. I was pleased with how the adjusted image looked pretty natural despite the amount of time spent adjusting the garland’s position. Here’s a before-and-after of my original RAW shot, and the color-adjusted image with straightened garland. I needed to address the absurd amount of noise and grain in my original image, too, which was due to the fact that I put no effort into lighting the original photograph. I saved out a jpeg image of each masked-out strand of garland, imported each jpeg into an Illustrator document, and used the Low-Fidelty Photo setting in Live Trace to get a painterly effect. Below you can see the original jpeg on the left, my Live Trace selection, and the result on the right. This removed all the unwanted noise and provided me with a very hand-painted effect that I thought worked well. I arranged the 7 pieces of live-traced vector garland on an Illustrator artboard, leaving myself enough space for a bit of copy between each strand, and being careful to arrange each strand so it would be uniquely cropped and not be immediately evident that I was only working with seven strands, but used a total of 12 strands for the step-and-repeat wrapping paper design. I also reflected some of the strands to further hide any kind of repetition in the artwork. The image area for each “tile” of repetition was 30” high and 36” long, so that also had to be considered for the overall pattern. 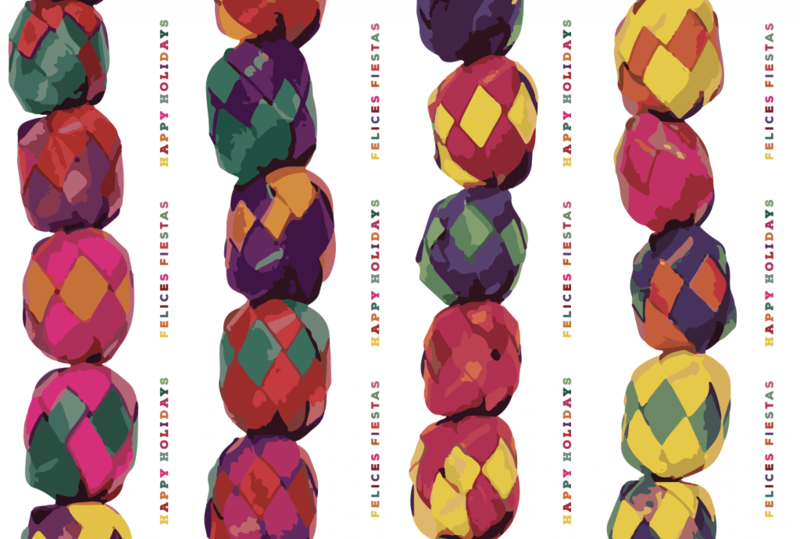 I selected a couple typefaces, set up “HAPPY HOLIDAYS” and “FELICES FIESTAS,” letterspaced as needed, then made each letter a different color that I eyedropped out of the garland. I still felt like the colors could be brighter and more saturated, so I imported my Illustrator file into Photoshop as a vector smart object and further brightened and saturated the colors for the final art, as shown below. 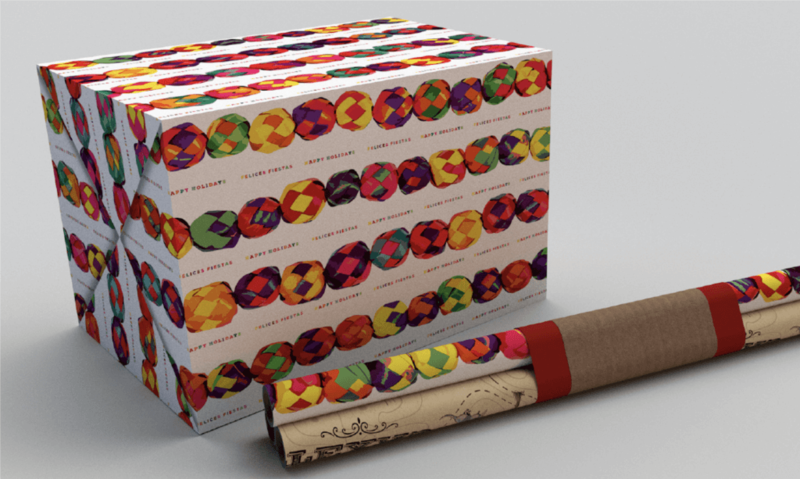 This was one of several wrapping paper designs that our designers and art directors created as gifts for some of our clients at the end of 2018. Texas Creative was thrilled to receive a Gold Addy and a Special Judges Award at the 2019 American Advertising Awards in February for all of our team’s designs. 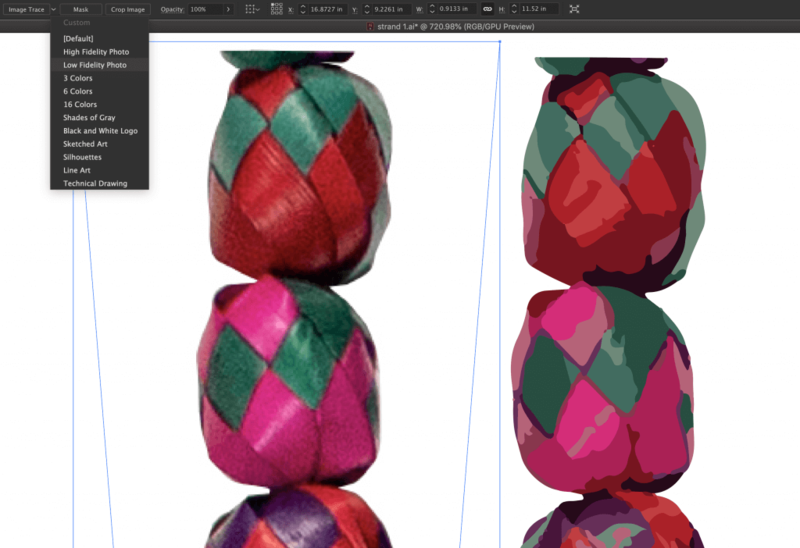 Have you used Puppet Warp in Photoshop as an integral part of your own artwork? Share with us in the comments below.